« Give a Donation to Children’s Music! Can’t Get Enough of that Pie! Th anksgiving is just a week away. How about a song about pie? For the past couple of years, I’ve enjoyed a song I learned from my pal Tina Stone in The Children’s Music Network. It engenders a special community spirit in many classrooms. I went down to the apple fair, I had three dollars and I spent one there. I got so happy, do you know why? I got me a piece of apple pie! 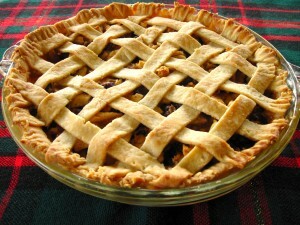 Oh pie, pie, pie, pie, I can’t get enough of that apple pie. Pie, pie, pie, pie, can’t get enough of that pie. I went down to the pie fair, I had no dollars to spend there. I saw those pies up on the shelf, but if I want some pie, I’ll have to make it myself. The fun part is thinking of all the different pies people like, including silly ones like popcorn pie. The motions are also great: I have everyone sit on the floor in a circle with their feet straight out in front of them, so it looks like a sliced pie. We count out how many dollars on our palms, and then we tap on our legs as we’re going to the fair. For the chorus, we “make our pie dish” by putting our arms around each other and swaying. This is tremendously popular with most kids. I went down to the county fair, I had four pennies to spend there. I bought a raspberry pie and took it home, put it on a shelf and I sang this song. Then, sing the chorus, which is the same. All I can say is pies are quite a bit cheaper in Canada. 2 Responses to Can’t Get Enough of that Pie! HI Liz, thanks for sharing my song! I like to start with 5 pennies (I use them because it makes it sound like an older song) and when we run out of Pennies I sing, I went down to the county fair, I didn’t have a penny to pay the fare, I couldn’t buy a pie to put on the shelf, so if you want anymore you can sing it your self! Kids in my programs LOVE this song! I put a movement twist on it, which has become their favorite part. When we sing the 2nd round of “Pie pie pie pie” – we rise up from our squat onto our tiptoes, and really SHOUT OUT the last ‘pie’, wave our hands in the air. Hope this makes sense. contact me off list if not!